Dedicated to the enjoyment and conservation of birds and nature. Went out to Red Canyon Park this morning for an hour or so. 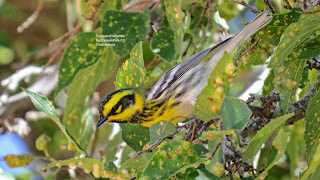 Though there were still a number of warblers in the hackberry trees, the numbers of warblers and their feeding activity had diminished considerably. However, there was a lively flock of Bushtits feeding furiously in one of the 3 large hackberry trees where the activity was concentrated. I am still catching up on my photos from my trip to SE Arizona including this one of a Black-chinned Hummingbird feeding her offspring. Sorry it's not crisp, bright and clear but the youngster was on a branch shaded by tree leaves and I stayed more than 50 feet away (though they were only about 10 feet off the trail) in order to reduce disturbance. Because hummingbirds are so small it takes a long camera lens to photograph them and this was shot with a 50 times normal zoom. 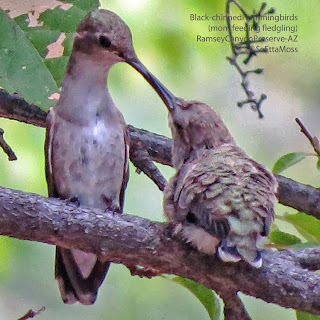 I have also enlarged the photo quite a bit so you can see her long bill is placed inside the baby’s bill to transfer the nectar. Ramsey Canyon is a popular place and a number of people walked by–if they walked too close the mom would leave or if out getting food she would not fly in by her baby so she didn’t give away the location. So it is important that those watching and photographing young birds keep their distance so they don’t interfere with feeding. 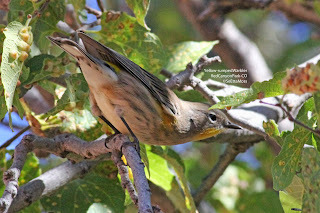 More photos of those wonderful Townsend's Warblers I enjoyed today at Red Canyon Park.